Locked-out New Zealand meat workers back on the job! The over 100 meat workers who have been locked out from the CMP Rangitikei plant since October 19 will return to the plant tomorrow, December 23, after ratifying a mediated settlement. Over 100 sheep processing workers have been locked out from the CMP Rangitikei plant since October 19 for refusing to accept up to 20% in pay cuts, shift changes and reductions in allowances. Locked out CMP ANZCO workers and their families picketed a McDonalds store in North Palmerston on November 23. On November 22 the National Union of Workers announced that an agreement had been reached on favorable terms to the NUW members on strike at Baiada Poultry, Australia's largest poultry producer and the main supplier to retail giant Coles. The agreement brings equal pay rates for all workers at the factory, the key issue in the strike. Members of the IUF-affiliated National Union of Workers (NUW) have been out on indefinite strike since November 9 at the Baiada Poultry plant in Laverton, Victoria. The key issue in the strike is the company's massive recourse to precarious labour and the refusal to pay comparable wages to non-permanent workers. 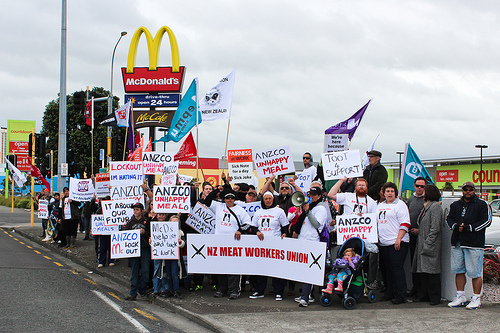 Members of the New Zealand Meat Workers Union at CMP ANZCO have been targeted by a particularly vicious form of union busting which is being practiced more and more in IUF sectors across the globe. It works like this: an employer proposes radical changes to terms and conditions in CBA negotiations, then goes through the motions of bargaining with the union while actually just biding time, then locks out the workers in an attempt to force a signature on an essentially non-negotiated agreement. Australia's National Union of workers has stepped up its poultry organizing efforts and launched a "Better Jobs 4 Better Chicken" campaign aimed at winning permanent work, safer workplaces and the production of better chicken. A new agreement covering 4,000 Hormel workers in five plants secures big wage increases, health care improvements and greater pension security for meatpacking workers and their families. The agreement sets a new standard for wages and benefits in the meat industry in the United States. A settlement has been approved by a US court awarding USD 32 million to more than 17,000 Tyson poultry workers in 41 plants in 12 states, the culmination of a long struggle for compensation for work already performed initiated by the IUF-affiliated UFCW 12 years ago. Overdue payments to contract farmers, interruptions in feed supplies, delays in contractual bonus payments for factory workers, unpaid social contributions: these are but a few of the indications that something is terribly wrong at the Brazilian subsidiary of French poultry producer Doux. CONTAC, which organises meat workers in Brazil, has been sounding the alarm since early 2011.